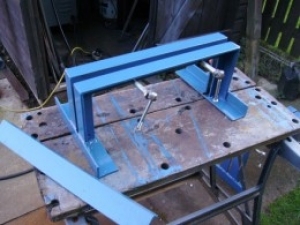 Homemade basic bender fabricated from angle iron. Two C-shapes are formed using 1.5" x 1.5" x 1/4" angle, which are then welded to a base. A 1/2" gap between the pieces serves as the bender's throat. As the builder mentions...the only moving part is the hammer bashing the steel into the shape you want. Hmmmm. Pretty simple, no moving parts!